When the State of Vermont shuttered three Chelsea businesses for tax reasons in December 2016, the impact on the community was palpable. "Chelsea was hurting," said artist and educator Carrie Caouette-DeLallo. "We lost three key businesses in town, and we didn't have a gas station for over a year. [It] does something very interesting to the psyche of the community to see boarded-up businesses." So Caouette-DeLallo responded in her preferred way: art making. In March of this year, she partnered with fellow area artists to launch the Chelsea Arts Collective. The group, which now has about 20 members, hosted its signature event, the Arts on the Green Market & Festival, last weekend. But evidence of its hard work will remain visible for months to come in the form of some 60 vibrant barn quilts and a barn quilt trail. Unlike its textile counterpart, a barn quilt is made from a single panel of painted wood. A barn quilt trail is a route featuring many such works. 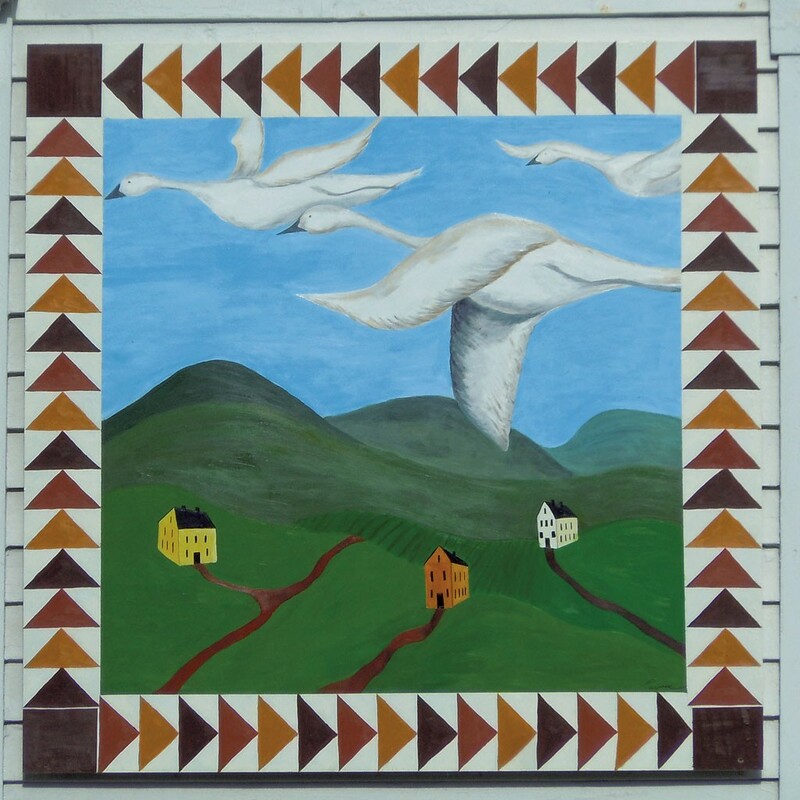 That idea previously took off in northwestern Vermont; some 260 colorful squares can be seen on the Franklin County Barn Quilt Trail. In Chelsea, the collaborative, inclusive nature of barn quilts appealed to the arts collective. The group partnered with the First Branch Community Collaborative in central Vermont and began to solicit local participants. Members posted brightly colored flyers around town, emblazoned with the question "Can art uplift a community?" Prospective participants were invited to email the Chelsea Arts Collective; instructions can be downloaded from the group's website. The guiding idea, according to Caouette-DeLallo, was If you're not an artist, so what? Do you want one of these on your house? She continued, "What's been fascinating about it has been who wants to do them. It's not just a bunch of painters from the FBCC, it's farmers. It's people who have family farms who have done these beautiful representations of their farms." With private donations of funds and supplies, and aided by a discount from nearby Bethel Mills Lumber, registered participants were welcomed to pick up a 4-by-4-foot wood panel and painting materials. Most participants aimed to complete and hang their panels in time for the August 25 festival. Caouette-DeLallo's husband, Tim Courts, helped many participants mount their quilts. "Most people have done something that's personal to them," she noted. Dickson Corbett's barn quilt, for example, features four ravens — "Corbett" is derived from the old French for "raven." Kate Willard used a pattern passed down from her mother, a quilter. A local beekeeping couple adorned their quilt with an intricate honeycomb motif. "It's funny where you see them — you're just driving along, and there they are," said Caouette-DeLallo. A map of the various barn quilts is available locally at Will's Store and the Chelsea Public Library and Town Hall. Soon it will be online as well. "This place just has so much heart," said Caouette-DeLallo. Learn more about the Chelsea Arts Collective and the Community Barn Quilt Project at chelseavt-arts.com. The original print version of this article was headlined "Chelsea Arts Collective Discovers Placemaking, Piece by Piece"